This documentary was released in 2011. It''s a pretty wild film that is both entertaining and serious at times. Watch it here while you can as the uploader says he's taking it down Monday. In the summer of 2006, two Bigfoot hunters led a group of curious, young paranormal investigators into the hills of southern New York on a quest for evidence of the legendary beast. 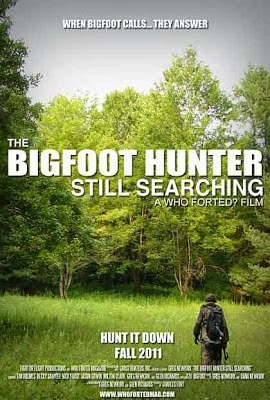 Shot completely on consumer level equipment with a budget under $50, this documentary follows Tim Holmes of the Southern Tier Bigfoot Watch and Becky Sawyer of Searching for Bigfoot Inc. as they trek deep into Connecticut Hill, a location rife with reports of mysterious monster sightings and unexplained events. Although initially skeptical of Tim's wild stories and unnerved by Becky's militant commands, things get weird after bizarre encounter in the pines, and the group is forced to reassess their beliefs regarding the existence of Bigfoot. Often funny, sometimes creepy, but always entertaining, "The Bigfoot Hunter: Still Searching" is a film that asks, what means more in the end: the destination or the journey; the evidence or the legend?